A modification of the NES Classic Mini console making it fully portable and adding arcade-like controls. A while ago the NES Classic Mini console has become available again, and I bought one for my wife, who’s a Mario fan. Since the console itself is pretty small, I was wondering about the possibilities of making it fully mobile so it can be used e.g. in a car or on a hammock. Two elements were necessary to use the console: a power supply and a video screen. Since the console is powered using a micro-USB port, it was easy to find that it can run pretty well on a high-capacity USB power bank. As for the screen, small TVs are hard to come by but I happened to own a cheap 7″ CineGEN camera monitor, bought long ago for my DSLR camera, and a camera monitor is essentially a very small TV. With these three devices combined, the NES was fully mobile and all it needed was something to hold them all together neatly. 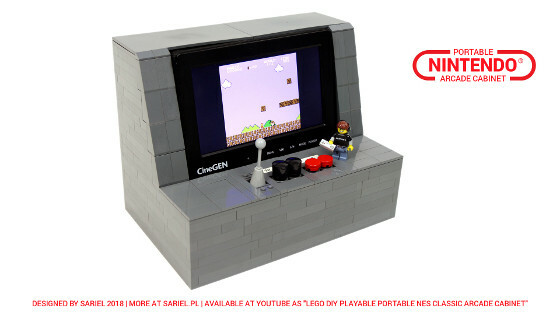 I’ve decided to build a simple LEGO box for the three devices (four if you count the NES control pad), and also to use this opportunity to change the controls a little. I used to play a lot of 8-bit games on arcade cabinets as a kid, and I’m fond of the arcade-like controls with a joystick and mashable buttons. So I’ve built extra LEGO controls on top of the NES control pad, basically doubling the original buttons but replacing the D-pad with a simple joystick. The joystick had a little play in it and the buttons were slightly less responsive, but all in all everything worked well enough to allow enjoying a game. The whole device was dead simple, but I felt that it’s worth to share the idea among other NES owners. It could be perhaps adapted to other consoles too – the camera monitor is certainly compatible with them – but this would call for seriously increased size and a power cord for the console. Perhaps the idea can be revisited once the recently announced PS1 Classic Mini is released.